I’ve never been a meatball-making expert – maybe it’s because I don’t have an Italian grandmother. (Grandma is Alsatian, but she makes a mean lasagna.) I could never quite master the art of browning meatballs evenly on all sides. Frying them yielded meatballs which were slightly charred on one side because I couldn’t get all of them in the skillet turned in time. Since they aren’t constantly turned, baking them turned out flat-sided meatballs. Then I discovered meatballs in the slow cooker! They turn out beautifully round. And thanks to the long, low, slow cook in marinara sauce, you’ve never had a more intensely flavored meatball atop your pasta – which makes up for a slightly spongy texture. I don’t brown them ahead of time because that would totally defeat the purpose of avoiding that whole frustrating step. Spaghetti and meatballs are classic comfort food, but I had a package of buckwheat noodles that had been sitting in my pantry far too long. 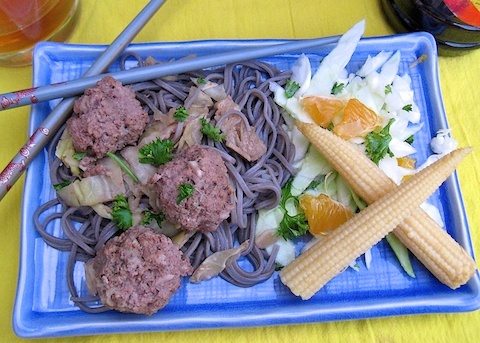 So I created this recipe for Asian-style meatballs to adorn the deliciously nutty buckwheat noodles. The garlic-studded meatballs are slow-cooked in a ginger beef broth; and the accompanying flavor-infused cabbage will have you asking for extra pieces of cabbage – as my kids did. In large bowl, with hands or a fork, combine beef, bread crumbs, egg, crushed garlic, a pinch of salt and 1/2 teaspoon pepper until well mixed. Form into 24 (1-in) meatballs. In 6-qt slow cooker bowl, place sliced garlic, broth, 1 cup water, fish sauce, soy sauce, rice wine, ginger, red pepper and cabbage; stir to mix. Gently place meatballs into slow cooker bowl. 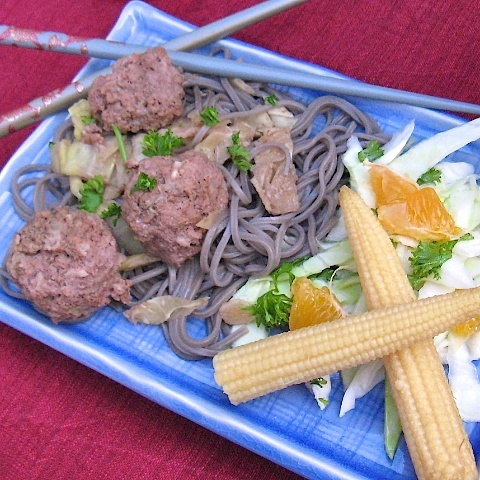 Serve meatballs and cabbage with noodles.